1998, Directed by Paul Jay. This amazing documentary exposes the truth about professional wrestling. Although wrestlers now freely admit that they are performing " sports entertainment," this is an industry in which the wrestlers are still accomplished athletes and very skilled at what they do. 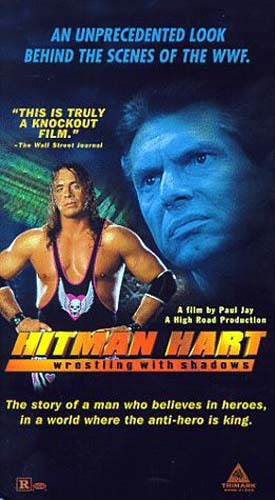 This documentary goes behind the scenes to show the way one-time WWF champion Bret "The Hitman" Hart was screwed over by WWF bigshot Vince McMahon. 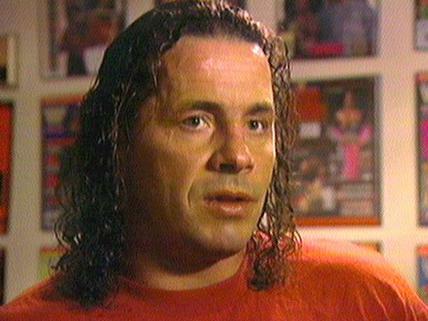 Much of this documentary shows Bret Hart's personal history and subsequent rise to fame in the WWF during the 80s. His father, who also used to be a pro wrestler, built a ring in the Hart's Calgary basement where he would dish out pain to toughen up his sons and their friends. Jay shows how Bret is considered a hero in Canada, especially in his native Calgary. I think the only other Canadian wrestlers at that time were "Rowdy" Roddy Piper and that guy in a Mountie suit who used to shock people with a cattle prod. Enter Ted Turner's rival WCW league. Ted began luring WWF star wrestlers like Randy Savage and Hulk Hogan away from the WWF by offering them astronomical salaries. Bret was one of those who was offered a large sum to switch allegiances. 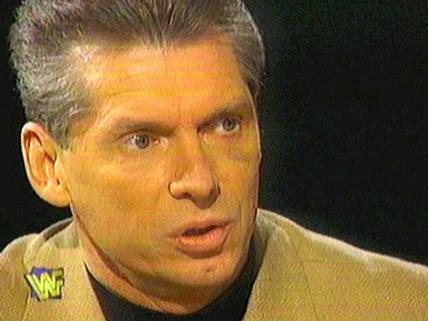 After thinking it over, he decided to stay with the WWF, who had helped build his career. McMahon offered him less money, but a 20 year contract. Bret's loyalty would not pay off. Starting to make it big in the WWF was it's next superstar, " Stone Cold" Steve Austin. 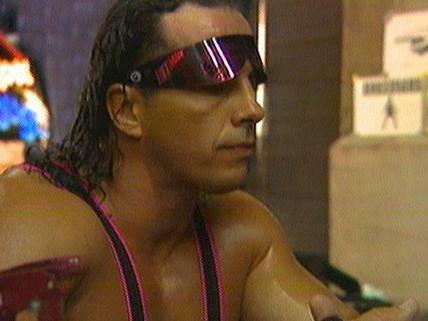 McMahon decided to pit Austin against Bret Hart, by having Bret declare Canada was better than the USA. This was a so-called "heel turn," a plot twist in which a hero becomes a villain. It wasn't long after that before McMahon terminated Hart's contract. Since Hart was guaranteed creative freedom with his character until the end, he decided he would defend his belt one last time, whereupon he would give the belt up for grabs. McMahon agreed, and decided to have Bret's last match in Montreal. It is this segment that is most interesting since Bret actually wears a wire into the dressing room to discuss the outcome of the match with McMahon. Needless to say, the match doesn't end the way Bret thought it would. Bret, extremely angry at having to lose his belt in Canada physically confronted McMahon behind closed doors after the event. Now wrestling for the WCW, Bret shares his reflections on the spectacle of pro-wrestling in a way that no one else has dared. He has broken the blue turnbuckle of silence. Personally, I am not a fan of wrestling at all, but I am interested in it's development as an entertainment industry from its days at carnivals up to the Japanese "death matches." Although I didn't find it is as good as Ron Mann's documentaries, this is another fine example of a Canuxploitation documentary concerned with low-brow culture that doesn't resort to standard McDocumentary methods.